Rhythmlink's PressOn™ EEG Electrodes are a line of disposable EEG electrodes designed to be placed quickly for fast, quality recordings. This innovative electrode provides you and your staff with a viable solution to collect CCEEG to provide information about brain function quickly, easily and accurately. Utilize your staff that is already present to achieve reliable, real time data to help establish the best patient care plan possible. The PressOn Electrode is also available as MR Conditional/CT PressOn™ and InvisaPressOn™ for artifact free imaging. Ideal scenarios for use of the PressOn Electrode include stroke, traumatic brain injuries, therapeutic hypothermia, identifying non-convulsive seizures, immobile, unconscious or comatose patients and for environments where an EEG technologist may not be available 24/7. Wondering how the skin looks after a PressOn is removed? 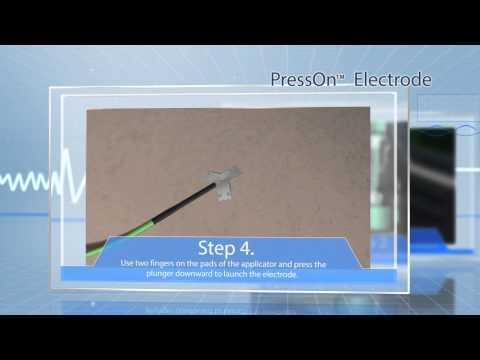 Visit our Customer Support page to learn more about the PressOn Electrode. Disposable PressOn Electrodes are not part of Rhythmlink's sample program. A Rhythmlink and Persyst collaboration.